It’s not every day you go to an electronica gig where the gent behind the laptop and Monome (more on that later) is dressed in Edwardian coat, tails and ascot, sporting Creedence-friendly sideburns. 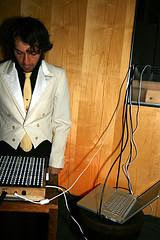 Santa Monica’s Alfred Weisberg-Roberts chose the nom-de-musique of Daedelus after spending his childhood daydreaming of becoming an inventor and in the last 6 years there have been an impressive slew of albums as well as countless singles and side-projects. This prolific musical output over the years has often combined samplings of 30s and 40s tracks with elements of left-field hip hop, outright dance music, soul and electronica and has led to work with such luminaries as Prefuse 73 and MF Doom. Onstage he takes the unique step of using the afore-mentioned custom-built Monome, made by a friend of his in Philadelphia, he tells me after the show. This is a minimalist sample trigger box connected to his Macbook laptop which represents his showtunes-era samples as lights darting across the unit’s display, while also giving him the chance to avoid the navel-gazing antics of some artists of his ilk and indulge in some nimble finger movement at high speeds. As pill-gobblers five yards away swill back the Budvar, Daedelus cranks out the tunes, comfortably contrasting IDM flourishes with chest-pounding breakbeat and house. The tiny venue on the top floor of Whelans is packed in front of him and as he bangs out the music the crowd’s euphoric responses have him beaming like a kid at Christmas. He flicks so fast between tracks and vocal samples that it is nigh on impossible to keep up, but his most popular tune, Fairweather Friends, is greeted with a huge roar by the up-for-it audience. At the end of the set, a beaming Daedelus has his hand shaken by nearly every punter around his equipment and then he is away into the night to do whatever it is Edwardian DJs do these days. A thumping, belter of a gig. Catch him next time he’s over. Playing Saturday night in Whelans. Unreal.